What are Orofacial Myofunctional Disorders (OMD)’s? What are the causes of OMD’s? Habitual open-mouth resting posture with tongue low and forward in the oral cavity. 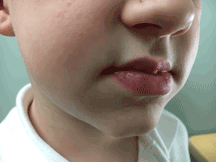 Initial stages of closure with facial tension evident (2-3 months into therapy). Relaxed closed-mouth resting posture (6-months later). What are the symptoms of underlying myofunctional disorders? 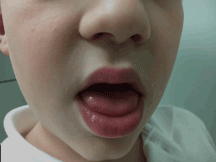 What is the evaluation process for orofacial myofunctional disorders? The orofacial myofunctional evaluation includes assessment of the oral structures and how they are used during speech and non-speech activities such as chewing and swallowing. 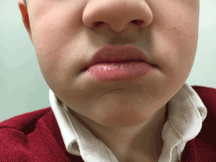 Part of the evaluation may include a referral to an allergy doctor, an ENT specialist and/or an orthodontist. Orofacial myofunctional therapy incorporates facial and lingual (tongue) exercises and behavior modification techniques to promote an adequate resting posture, which includes the correct placement of the jaw, teeth, tongue and lips at rest. Techniques used to engage the correct facial and lingual movement patterns necessary for adequate chewing and swallowing in order to eliminate a tongue thrust or reverse swallow pattern. Work with dentists and orthodontists to assist in successful orthodontic treatment. Children often need help and encouragement from their family to practice their treatment exercises. You will see the best results when the family works with their child every day. If you have concerns regarding your child’s speech as it relates to chewing/bolus collection and swallowing, please contact Jenifer Midili, Clinical Director – Falls Church, at: jmidili@cslstherapy.com or (703) 685-1070, Mailbox 2. Or, click here to complete/send our Falls Church contact form.